WE HAVE ALWAYS POSTULATED that the absence of a strong Two-Party can sow its own set of electoral chaos. Look at how orderly the elections are in the United States with the Republican and the Democrats wowing their audience with real party platforms. Once upon a time, we also had the Liberal Party and the Nacionalista Party as the dominant parties in RP with the third candidates virtually not having a fair chance to get into the winning column. The dictator Ferdinand Marcos destroyed all that by creating a monolithic political administration party where the rest were merely props to give the world a “showcase of fake democracy “. Post EDSA I became an election of personalities than ideologies. Look at the confusion Bohol politics has become, resulting therefrom. In mid-term polls, everyone wants to belong to the administration party to make use of its largesse, political machinery and clout with the citizenry. Now- it is barely a month away from the October filing of the Certificates of Candidacies or CONA (accreditation) and front runners Cabsec Leoncio Evasco Jr. and last termer 3rd district representative Arthur Yap wanting to be known as Duterte’s Candidate. In terms of historic closeness, no doubt Evasco has the edge. They were enemies of principles when Evasco was with the underground left, having left the priesthood for socio-economic principles and Duterte was his legal prosecutor. Strange bedfellows, post-EDSA found the two cozying up to each other and Tuloy becoming Digong’s trusted political lieutenant. 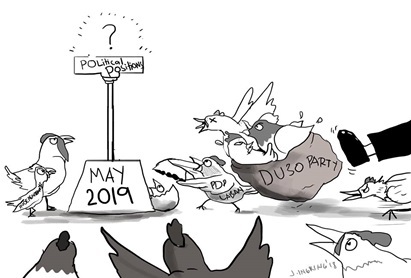 It is no secret Evasco formed a ragtag team of campaigners on a shoestring budget and as General Campaign Manager ushered Digong to the Palace with a plurality vote of 40% in 2016. He was rewarded ( and “punished?”) with the management chores over five important government instrumentalities to take the load off the president’s back. Vice Governor Dionisio Balite, a ranking PDP-Laban (officially the president’s national party) disclosed Evasco is his party choice for governor and he slides to be the congressional bet of the vacated third district post. Not so fast, as another PDP stalwart who says he is the provincial head of the PDP-Laban, former Mayor Doloreich Dumaluan (Panglao). As such, he nominates Yap as the gubernatorial timber who has gotten a lot of mileage through the ascension of (very close Duterte advisor and ally) former President Gloria M. Arroyo (who is also now a PDP-Laban for good measure) to Speakership and who made Yap as Deputy Speaker, to drive home this important point. Before that, Yap was already an influential Chair of the House Committee on Economic Affairs which brought him in many same airplanes with Digong to foreign forays. Faced with this dilemma – who will Digong anoint between Evasco and Yap? Aris Aumentado as second district congressional bet. Will the townships also have a similar set of feuding but allied forces aching for the voters’ sweet yes- like suitors courting the same maiden? If so, what will each candidate’s affiliated political party to be stated in their respective CONA? In that scenario, the electorate will decide who between the two Digong stalwarts will bring the best for Bohol in the years to come. But then, who is the real Opposition here? What party name will they submit? Would it be the Padayon Bol-anon with the last termer Gov.Edgar Chatto expected to be the first congressional bet while the last termer Rep. Rene Relampagos could be the possible running mate of Rep. Yap? But how can an “Opposition” support an administration candidate? Will the “Opposition” put up a candidate against Aumentado? But stranger things have happened in this crazy multi-party mileu. How about the four probable congressional bets in the 3rd district, what will be their CONA political parties: former Carmen Mayor Che-che Toribio, retired Judge Fernando, and Board Member Alexie Tutor? Of course, Vice Gov. Balite who already made official his intention to bid for a congressional seat is with PDP-Laban. At the end of the day, party affiliation is no longer a substantive issue, it would seem. Getting that CONA and projecting one is the “better personality” is the sad name of the game. Our Democracy of 1986, it seems, has retrogressed rather than advanced into maturity? Someone should legislate back the institutionalization of the Two-Party System. It will be healthy for both candidates and the electorate. WHO IS IN CHARGE DURING CALAMITOUS WEATHER? IN TIMES OF EMERGENCY, there should be no usurpation of duties and functions in major government agencies. But that is exactly what seemed to have happened last week when the Philippine Coast Guard took upon themselves to declare whether the weather would be safe for ships to travel. Everybody had thought that it is always the PAGASA to be the party to inform the public on the interpretation of the weather condition in a place. What happened was that despite the absence of a storm signal and a gale warning by PAG-ASA, the Coast Guard announced the cancellation of trips of all interisland vessels. When has the Coast Guard been given the authority to issue such order even without basing from the PAG-ASA weather bulletin? It was good that after about two hours, the Coast Guard lifted its suspension order for vessels. allowing them to resume trips by noontime last Thursday but only to say again that trips be suspended five hours later. Were they again pre-empting a weather forecast from PAG-ASA? Yes, indeed the public can praise the Coast Guard’s “safety first” policy but to the detriment of trade and commerce. There are always two sides to an issue. What was clear to everybody was that the skies were clear and the weather still fine. But trips were canceled, but why? This discussion on the right time to cancel boat trips hasremained unresolved. Many years ago, well-meaning sectors like the tourism and the business sectors voiced out their opinion that it’s not logical to just suspend the trips when the weather was still fine considering that the trip between Cebu and Tagbilaran is just for 1.5 hours. Perhaps, this thing needs some clear-cut legislation in order to avoid further unnecessary losses in trade and commerce. Bohol should be extended some special consideration in this issue since thousands of tourists who come and go from Cebu can be stranded either on their way here or on their way back to Cebu where connecting international flights await them at the Mactan Airport. One can just imagine the stress of the tourists whenever this would happen., This will create a strong “turn-off” factor for tourists to come to Bohol. What about business supply deliveries, crucial meetings, and legal court hearings? Can we just ignore their importance to the common Filipino? It is hard to believe that after all these years, we are still debating who is The Boss when calamitous weather ensues or threatens. It just smacks of weak leadership somewhere.